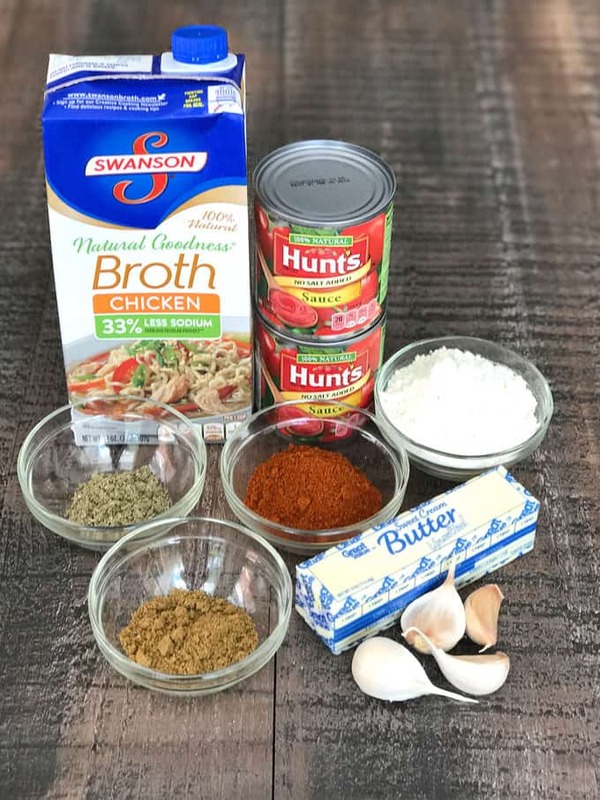 I used the following ingredients for the red sauce: Butter, garlic, all-purpose flour, chicken broth, tomato sauce, chili powder, dried sage, and ground cumin. I started by cooking minced garlic in melted butter in a saucepan over medium heat for about 30 seconds. 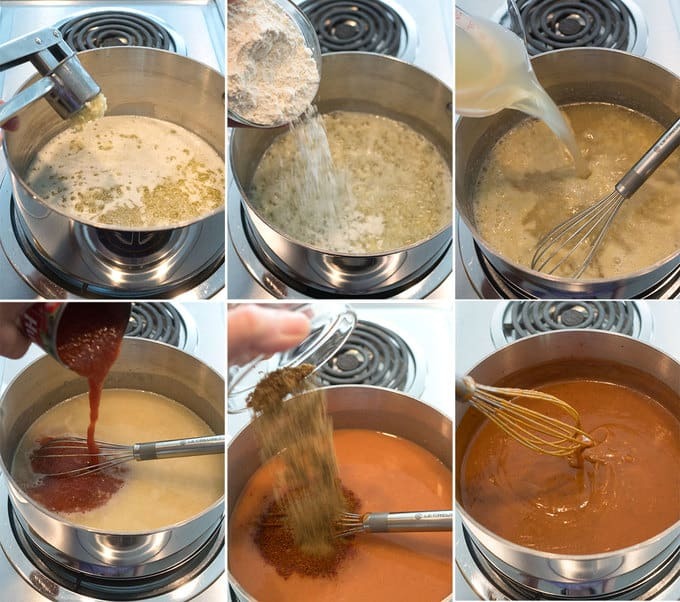 Then, I whisked in the flour to form a roux. After about a minute, I added the chicken broth and tomato sauce, and whisked the mixture to combine everything. Then, I added the chili powder, sage, and cumin, and cooked the sauce over medium heat until it had thickened and was smooth. How easy is that? Once you taste this red sauce, you’ll never go back to the canned stuff! 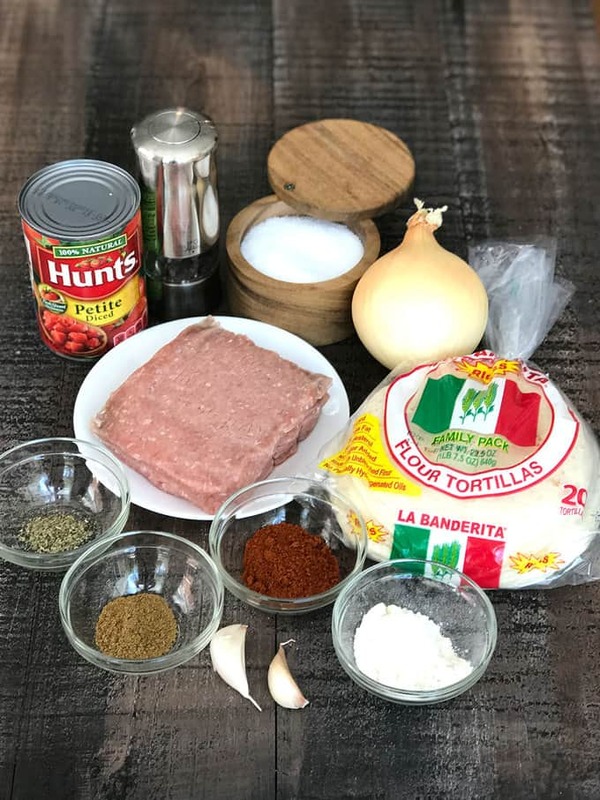 I used the following ingredients for the meat mixture: Ground turkey, onion, garlic, chili powder, ground cumin, dried sage, salt, all-purpose flour, and petit diced tomatoes. I could have used ground beef as well. 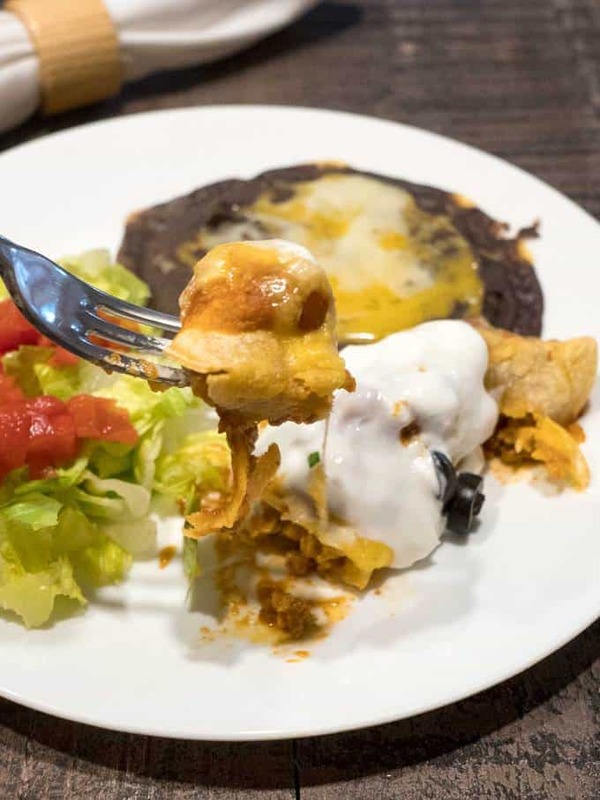 Generally, I use flour tortillas, but could have used corn tortillas as well. I started by browning the ground turkey in a large skillet over medium heat. Then, I poured it in a colander and ran hot water over it to remove as much grease as possible. While the meat was draining, I sautéed the onion in the same skillet for about 5 minutes. Then, I returned the browned meat to the skillet, and stirred to combine the onion and meat. Next, I added the minced garlic, and cooked the mixture for about 30 seconds until the garlic was fragrant. After that, I added the chili powder, ground cumin, sage, and salt. Then, I added the flour, and stirred to combine everything. Next, I added the tomatoes, and stirred the mixture over medium heat until it had thickened. I actually thought that it was too thick, so I added about 1/3 cup of water. I covered the skillet and simmered the meat mixture for about 30 minutes. After 30 minutes, I removed the lid, and continued cooking the meat mixture until most of the liquid had evaporated. This took 10 more minutes. I only made enough enchiladas for the Master Taste Tester and me. First, I added some of the red sauce to the bottom of a baking dish. Then, I added about 1/4 cup of the meat mixture to a 6-inch tortilla. I rolled up the tortilla and placed its seam-side down in the baking dish. After I had rolled five enchiladas, I topped them with some more red sauce and chopped onions. I covered the enchiladas, and popped them into a preheated 350° F oven for about 20 minutes. At this point, I removed the cover, and sprinkled cheese on the top. I used a combination of Cheddar and Monterey Jack cheese. 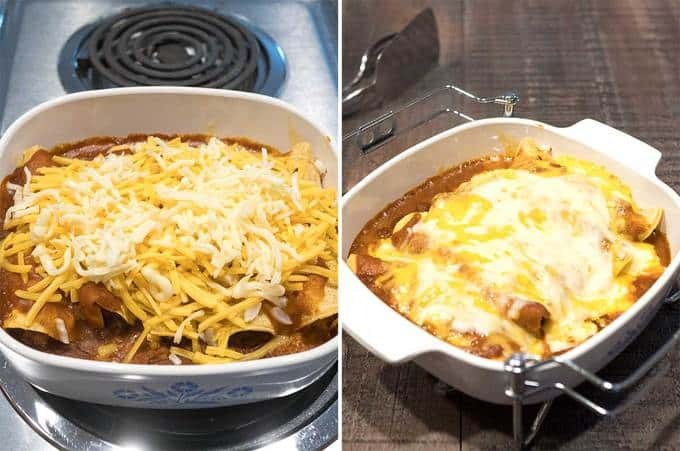 I returned the enchiladas to the oven for another 10 minutes or so until the cheese had melted and the enchiladas were bubbly. Before serving the enchiladas, I topped them with some sour cream, and sprinkled on sliced olives and chives. I served them with Smashed Black Beans, and a salad. They were absolutely delicious. Yum! Red Sauce: Cook minced garlic in melted butter over medium heat for 30 seconds, or until fragrant. Whisk in flour; cook, stirring constantly 1 minute. Gradually add tomato sauce, and chicken broth. Stir to combine. Add chili powder, sage, and cumin. Cook over medium heat, stirring occasionally, until smooth and thickened. If too thick, add additional chicken broth to desired consistency. Yield: 4 cups. 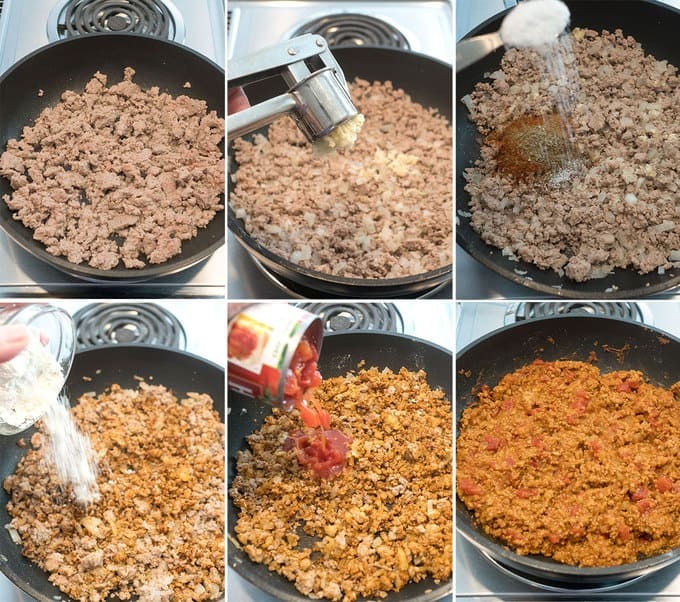 Meat Mixture: Brown ground turkey in large skillet over medium heat. Transfer to colander; rinse with hot water to remove as much grease as possible; drain well. Sauté onion in same skillet over medium heat for 5 minutes. Return browned turkey to pan, rubbing between hands to break up. Stir to combine. Add garlic; cook 30 seconds or until fragrant. Add chili powder, cumin, sage, and salt. Stir to combine. Add flour; stir to combine. Add tomatoes; stir to combine. Cook until mixture has thickened. If too thick add about 1/3 cup water. Cover and simmer over medium low heat for 30 minutes. Remove lid and continue cooking until most of the liquid has evaporated, about 10 minutes. Forming Enchiladas: Preheat oven to 350°F. Pour 1-1/2 cups of red sauce into 9x13x2-inch baking dish; set aside. 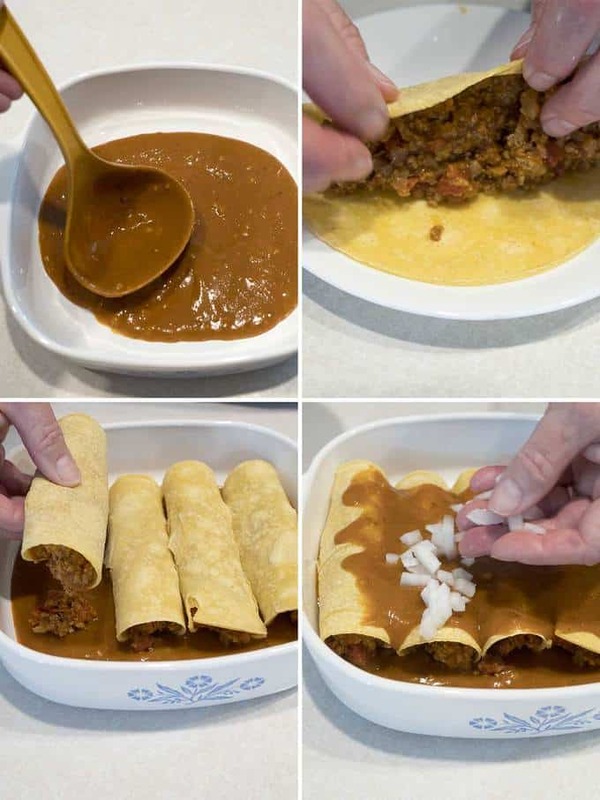 Microwave tortillas for 10 to 15 seconds to soften. Working one at a time, add 1/4 cup of meat mixture to center of tortilla. Roll tightly and place, seam side down into prepared dish. Repeat with remaining tortillas. 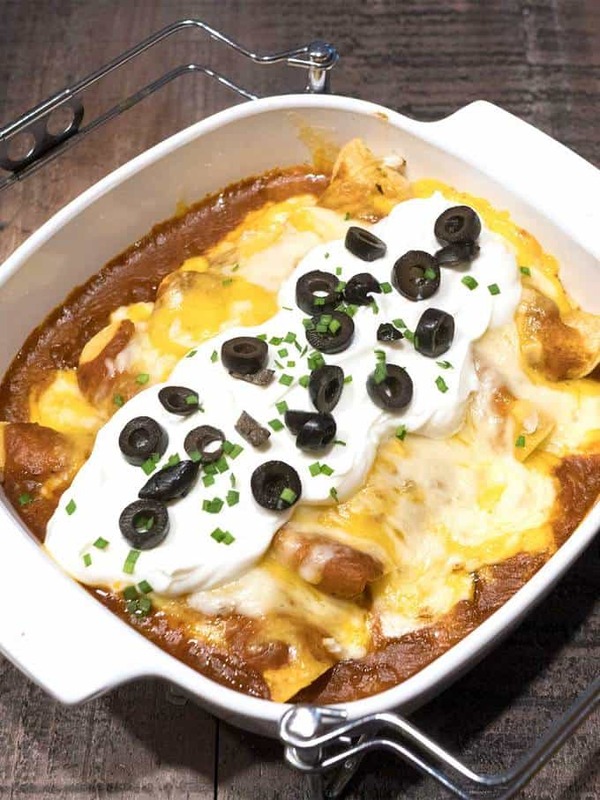 Pour 1-1/2 cups of red sauce over enchiladas. Sprinkle on chopped onions. Cover and bake at 350° F for 20 minutes, or until bubbly. Uncover and sprinkle with cheese; bake uncovered for 10 minutes, or until cheese is melted. Garnish with sour cream, sliced olives, and chopped chives. I do remember Della's. It was amazing!